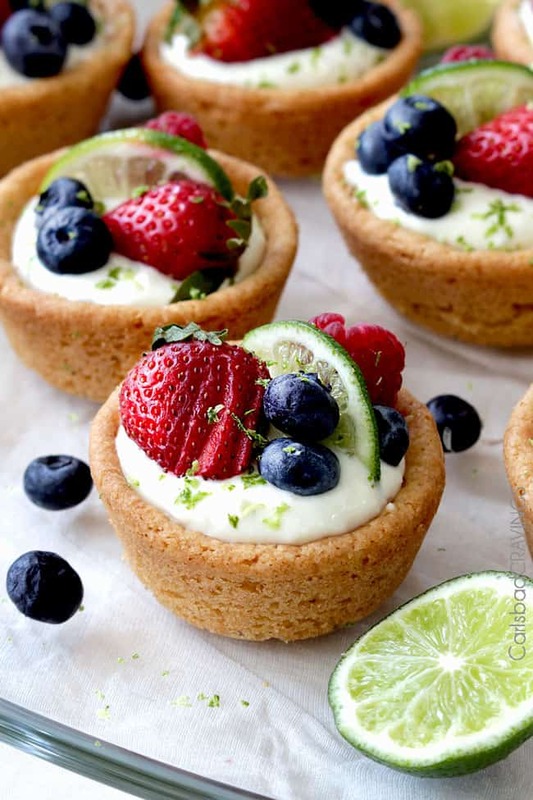 Impressive and delicious EASY NO BAKE key lime cheesecake filling cocooned in soft sugar cookie cups made from pre-made cookie dough – doesn’t get much simpler or delicious! Perfect for any occasion, like Easter or baby/bridal showers! You might have noticed I’m somewhat obsessed with cheesecake – so rich, silky and creamy. 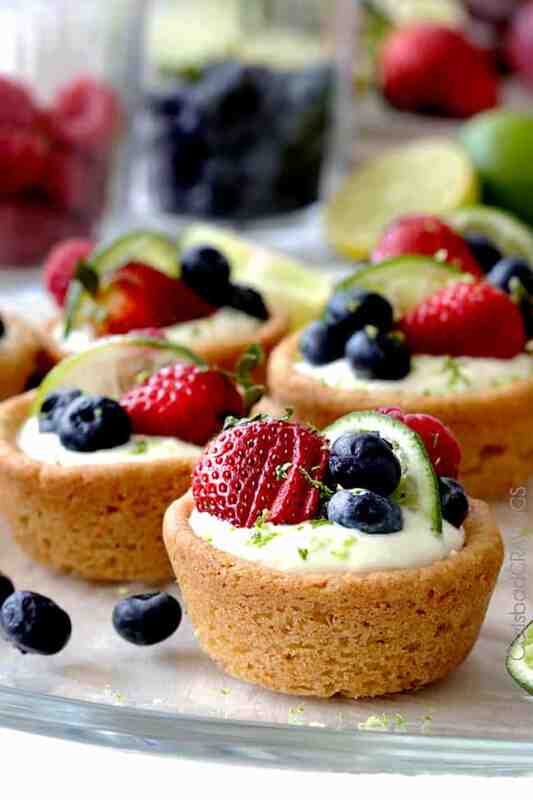 And now I am obsessed with these Key Lime Cheesecake Sugar Cookie Cups. 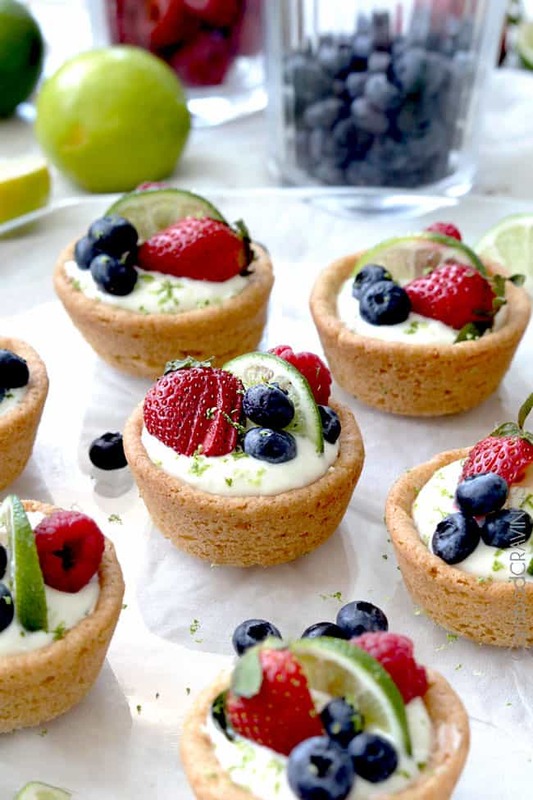 The velvety cheesecake is sweet, tart and comprised of just a few ingredients – Greek Key Lime yogurt, cream cheese, sugar, vanilla and finished with key lime zest (if you can’t find key limes, you can substitute regular limes), whisked to silky cheesecake creamyliciousness. Then baked until just golden so they remain super soft, melt-in-your-mouth chewy. 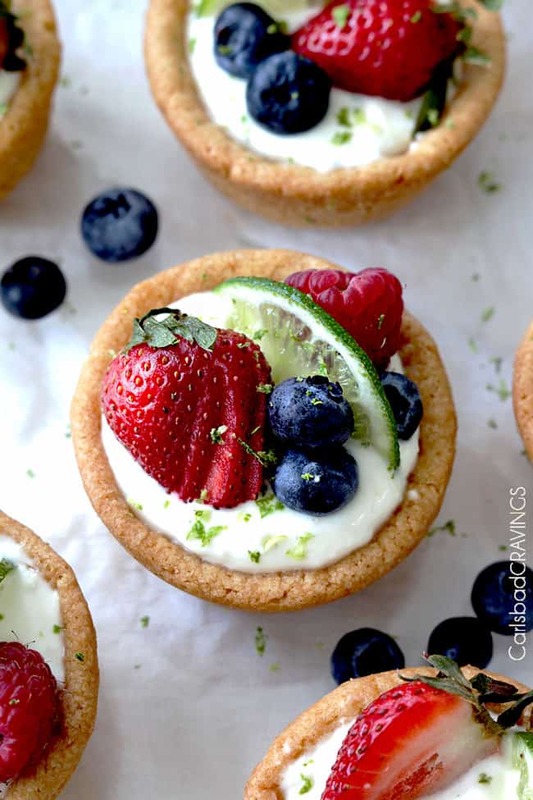 Then filled with your easy no bake Key Lime cheesecake. 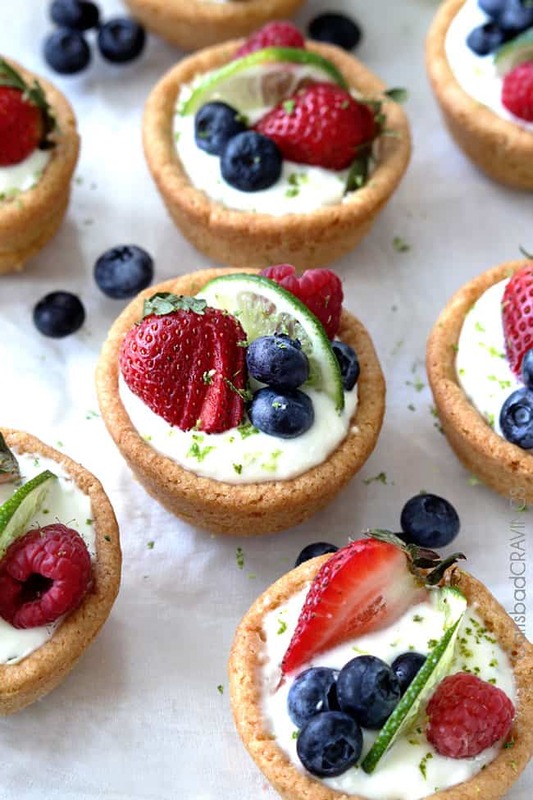 If you can’t wait – and I couldn’t wait – you can immediately top and dig into the soft, sugar cookie stuffed Key Lime Cheesecake Cups. Perfect either way. Perfect for any occasion. 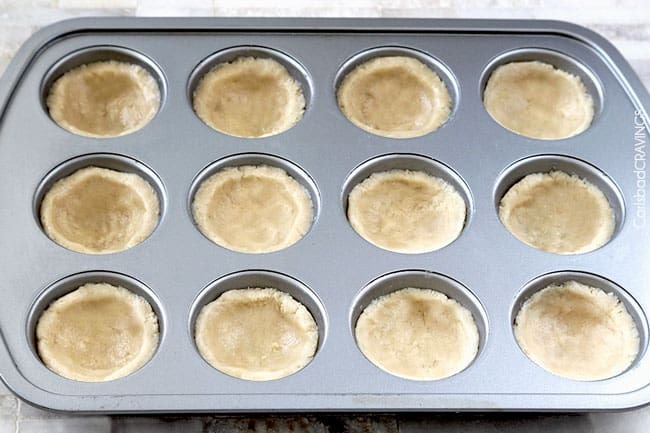 Grease a 12-cup muffin tin with nonstick cooking spray with FLOUR (like this)*. Cut cookie dough into 12 even slices and press into the bottom and about 2/3 up the sides of prepared muffin cups. Bake for 18-20 minutes or until edges are barely golden. Let cool 5 minutes then gently transfer to a wire rack to cool completely (about 20 minutes). Meanwhile, in a bowl, beat cream cheese, Greek yogurt, vanilla, and 1 tablespoon key lime juice until smooth. Gradually beat in powdered sugar. Stir in key lime zest. Taste and add additional tablespoon lime juice if desired (how I like it). 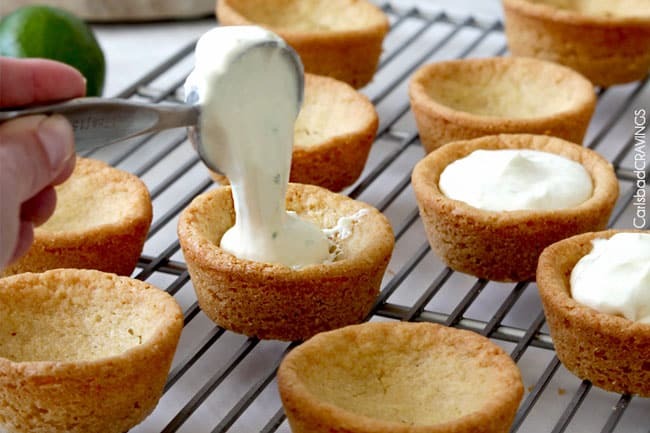 When cookie cups are cool, evenly spoon cheesecake filling into cups and refrigerate 1-2 hours to set. If you don’t want to wait, they are still delicious right away, the filling will just be softer. 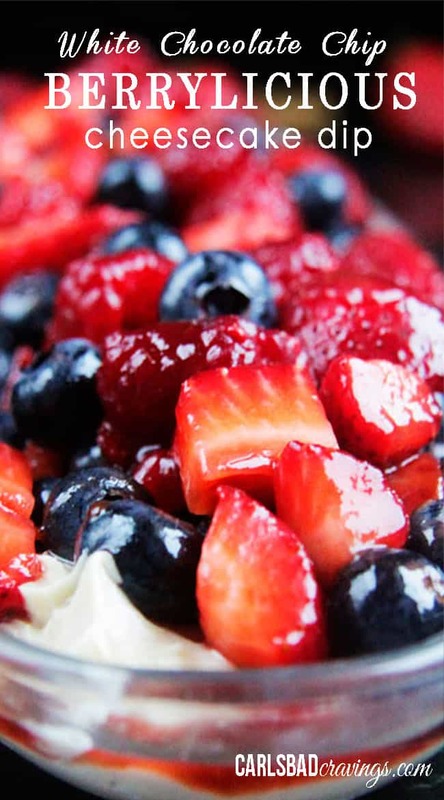 Garnish with berries and whipped cream if desired. *If you don't have nonstick cooking spray with flour, you can use regular nonstick cooking spray and sprinkle the bottom of the muffin cups with a little sugar but I can’t guarantee all of the cookies will come out cleanly. Thank you so much Rina! They are pretty tasty, I hope you love them! I love love key lime! These little desserts look so good! Thank you so much Jennie! 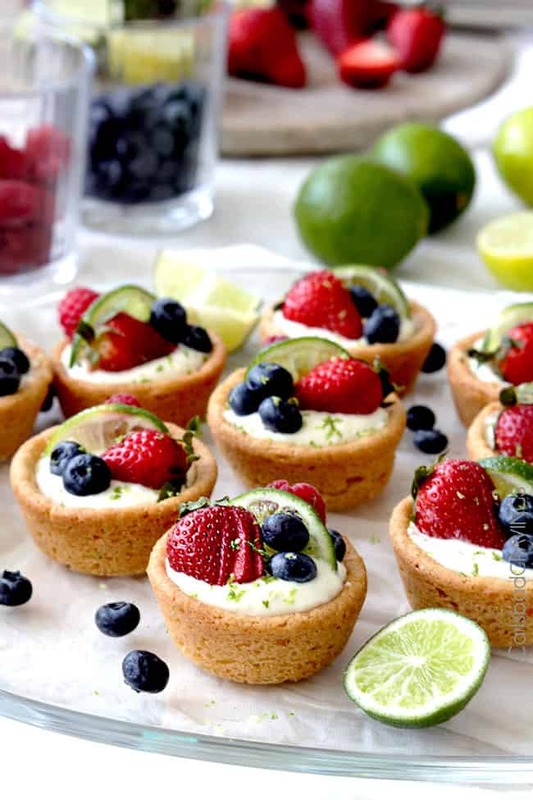 If you love key lime, I think you will be a fan! Enjoy! My husband LOVES key lime, and is constantly asking me to make him a key lime pie. But this looks so much easier! Not to mention delicious! I can’t wait to try these out! Yay! So happy you can have a MUCH easier option! I am excited for you to try them out as well – can’t wait to hear what you think! Enjoy! Love bright, colorful desserts like this! Perfect for spring! Gorgeous and delicious cupcakes. Looks so inviting! Thank you so much! I love a happy cupcake :)! Made these for an Easter luncheon and they were a big hit! Thanks for sharing this recipe! YAY! you are so welcome Marguerite! I am so happy they were a “hit”! Happy belated Easter! will these taste good the next day? overnight? Absolutely Kate, even better the longer they are refrigerated! Enjoy! 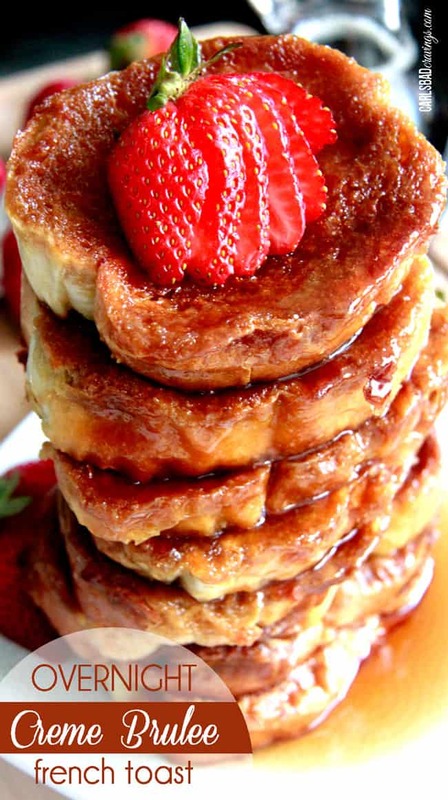 Will these get soggy if you make them the night before? No the filling will set as it refrigerates so it won’t be soggy – hope that helps! Enjoy! Are these made in a regular size muffin tin or a mini muffin tin? Can’t wait to try these! Thank you. Hi Debbie! They are made in a regular size muffin tin. Enjoy! Have you ever tried freezing these? Thanks! Hi Becky, I haven’t tried freezing them but typically I love frozen no bake cheesecake so I think it should work just fine. good luck! 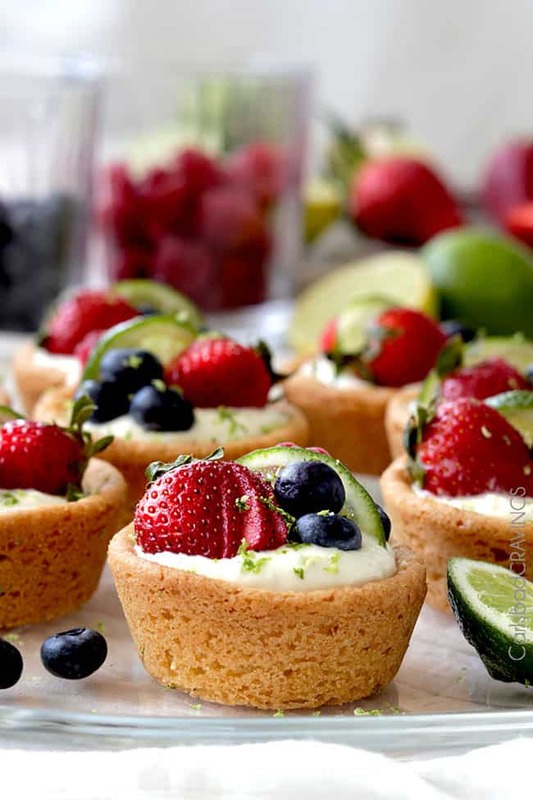 I am gathering recipes for a Ladies Tea at church and these look so delicious! Do you think the recipe would work in mini muffin tins? 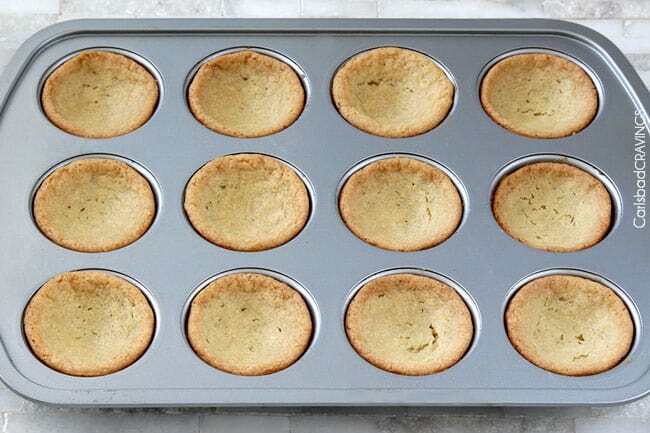 Hi Alyson, I think it would work but it might be hard to manipulate the sugar cookies into such a small mini muffin tin – but if you have the patience, I think it would be delicious! Thanks for your reply! I think I will do a practice batch. Do I need key lime yogurt? Can I substitute something else? My cookies puffed up too much in the muffin pan and there isn’t room for the filling. Any suggestions? They should settle down after cooling, but you if you need to once they are cool, you can also push them down with your fingers, spoon or cup. Made this for a luncheon yesterday and what a BIG hit! Everyone thought I had bought them. Lots of raves and requests for the recipe! So yummy! Thanks! YES! That is awesome Holly! I am thrilled they were such a hit with so many people wanting the recipe! Thanks for taking the time to make my day! I dont have lime greek yoghurt, what can substitute ot with? Hi Aya, unfortunately that is the main flavor component so there is not a good substitute except regular lime yogurt. Would these be ok refrigerated overnight? 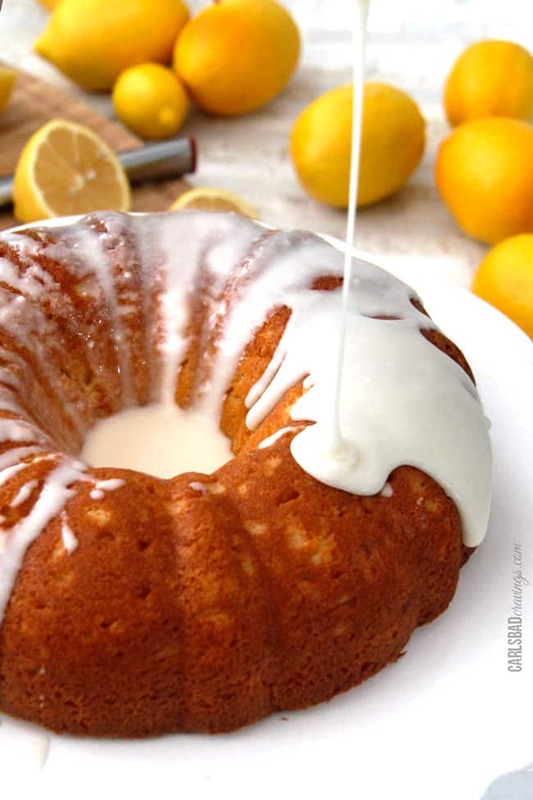 Can you substitute for lemon yogurt, lemon zest and lemon juice to have a different flavor to offer? Hello Jen, this recipe sounds wonderful. I am planning on making it for a graduation party. Can I make this in advance, if yes, how many days in advance? Please let me know. Hi Marion, I wouldn’t make the cookie cup crusts in advance because they won’t be as soft and chewy. The cheesecake portion you can definitely make in advance – probably 3 days is good.